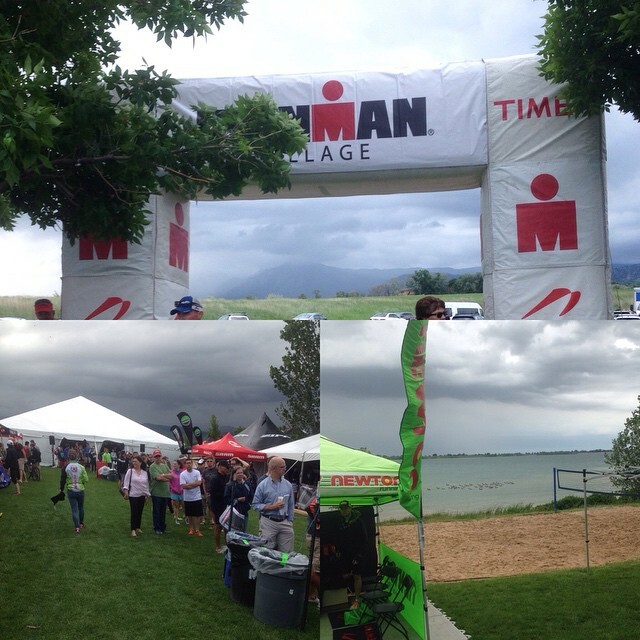 First triathlon of the season…..check! This one will be remembered for lessons learned. 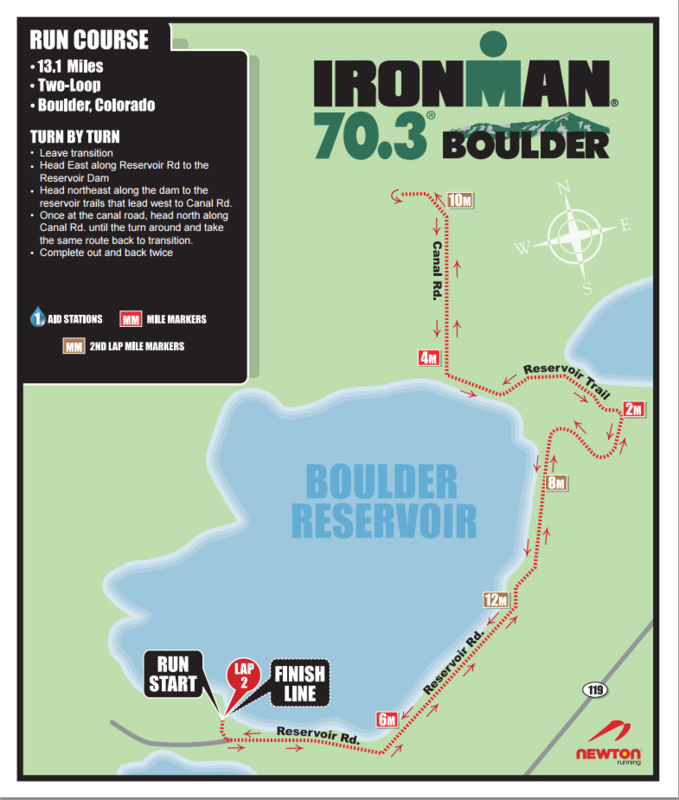 Ironman Boulder 70.3 is a great race, I participated in it in 2013 as well back when it was held in August. 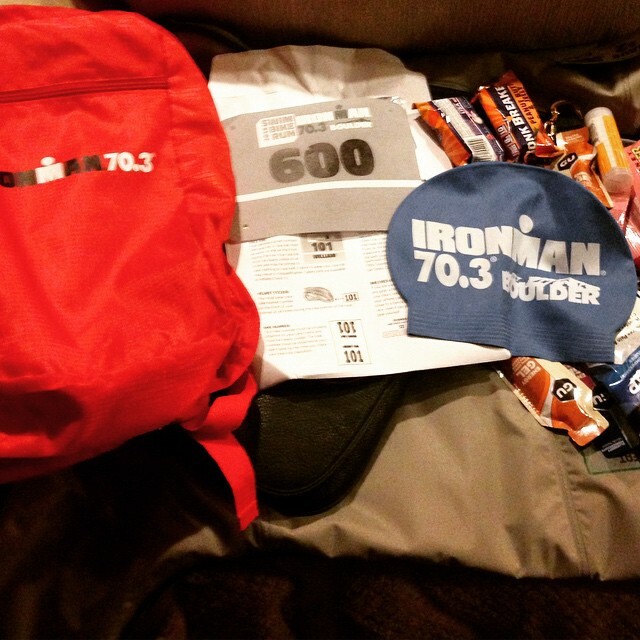 It was a perfect tune up for Ironman Lake Tahoe. In 2013 it was a huge PR for me, too bad I didn’t write a report! This year there was no PR for me but I didn’t really expect one. I knew that I had a slightly better build up to Tahoe given that I had all summer and this spring has not been kind to us in Colorado. Also this was my first triathlon in over a year so I went in expecting to shake off some cobwebs and pretty much “train through”. Also I decided to not take any time off for the race since it was local, bad choice! With a Friday mandatory bike drop off and lots of logistics that I am clearly rusty on, prep was a bit stressful. 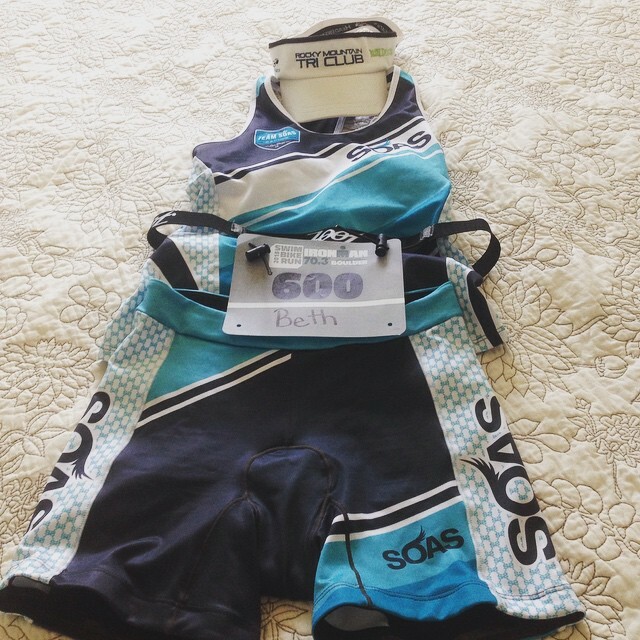 Pre Race – I just bought a new Xterra Vector Pro wetsuit I took it for a test spin and realized it was much too big 3 days before the race. Jackie from Xterra was awesome and rushed me a new suit that got to my house Friday afternoon. So much for nothing new on race day! I was a little worried about the forecast the days leading up to the race, it was stormy and cold. It was supposed to be sunny most of the day race day which was good but I was not at all heat acclimated so I assumed it may be a challenge. Even though prep was a little rushed things went pretty well and it was nice to sleep in our own bed the night of a race. We work up at 3:15 am, drank lots of coffee and scarfed down a bagel with peanut butter. After that I stuck to Gatorade until after the swim (full sugar), this was possibly a mistake. 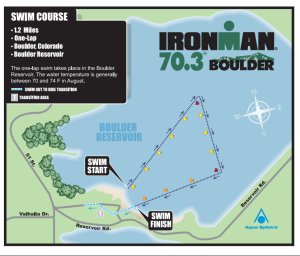 We got to Boulder Reservoir with plenty of time, it is nice not have to wrangle a bike in the morning and just have a transition bag. I was a little nervous setting up transition since it had been so long and I was worried that I had forgotten something important. I met up with Cory and my mom (who was racing the sprint) and headed to warm up. I got into my wetsuit and waded into the swim area. It’s always nice when you can get into the water before the race. The water felt good, not cold at all, a sleeveless wetsuit would have been perfect given that temps. Cory’s wave went off 30 minutes before mine so I wished him good luck then stood around chatting to other ladies as we waited. In 2013 they used the “swim smart” start, this year it was age group waves. I don’t think either was much different than the other. After waiting what felt like forever we waded into the water and waited for the gun. Swim – 42:45 // Was really hoping for sub 40, maybe next time. Luckily the swim course was pointing just enough to the north that we weren’t sighting directly into the sun. 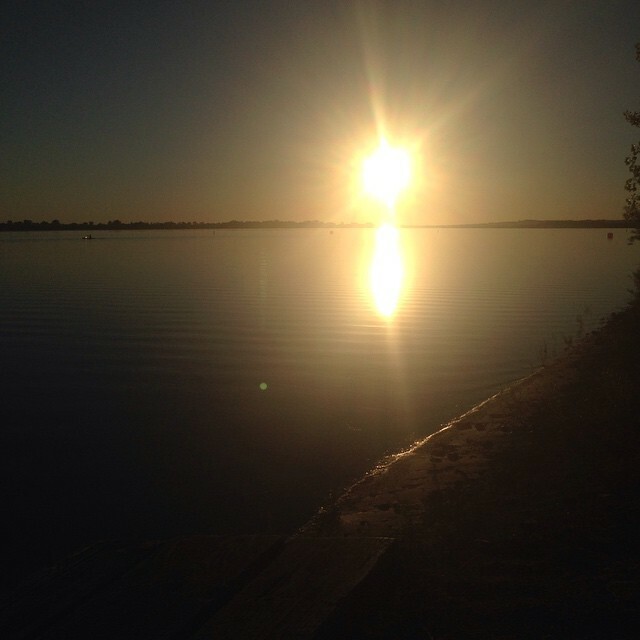 I have had to do that before at Boulder Reservoir and it’s blinding. 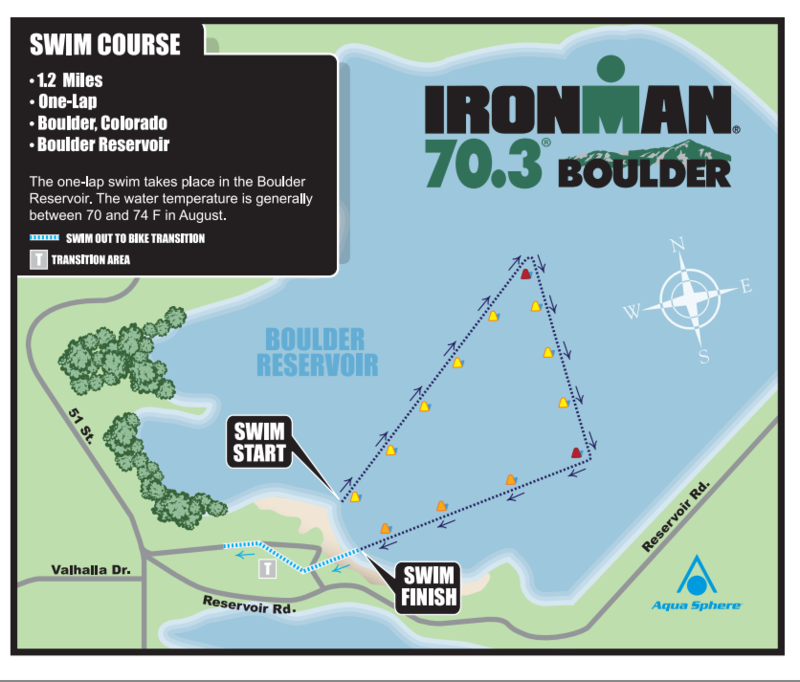 The start was smooth, I took an outside line given the angle and had clean water to swim. I tried to find feet to latch onto but they just seemed to be either too fast or too slow. So I Goldilocks’ed all by myself for most of the swim. Things went well even when I hit traffic at the two turn buoys. Things took a bad turn when I got half way back on the third leg. 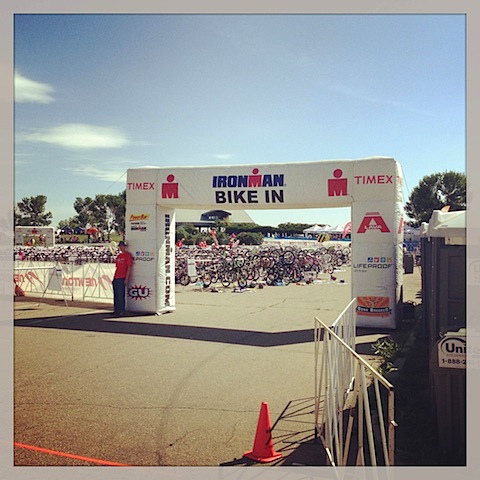 Ironman decided to run their sprint race at the same time as the half. Their swim started after all the 70.3 racers had started their swim. This meant that people racing the sprint would run directly into people trying to finish their half swim. It was a giant cluster as swimmers of all different speeds combined for the last stretch. 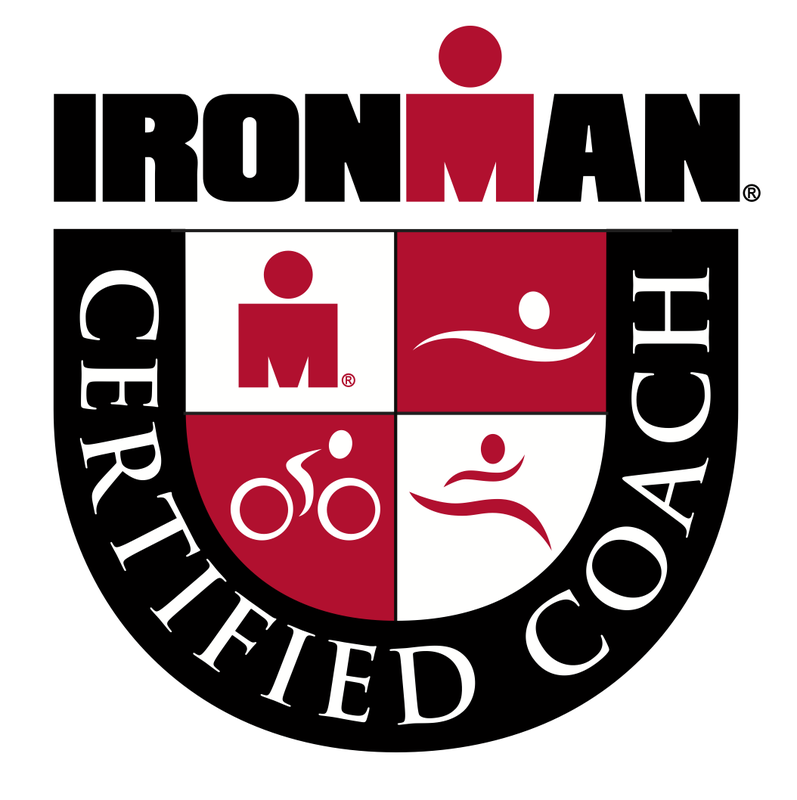 What made me really mad was thinking about how the men racing the 70.3 didn’t have to deal with the jumble, they all started before the women in the 70.3 so were out of the water before the sprint even started. It took me a significant amount to time to wind my way through the mess of people. I also was dunked, kicked and punched a lot. I also felt bad for the people racing the sprint who had to deal with all of us. This was not a great move by WTC, I was slowed a little and annoyed, but people who are nervous swimmers in the sprint were traumatized. I wish they would have waited longer before starting the sprint race, my mom did not have fun on her swim. T1 – 4:09 // Moving into T1, I felt ok, a little dizzy from swimming so long then moving to running, I also felt really hungry. I saw my dad, and headed to my bike. I put sun block in my transition area knowing this was one of the first days of sun for the season and my skin was still winter white. I did the best job I could (not good enough, ouch! ), threw on my helmet, glasses and shoes. On the way out I ran into a wall of sprinters trying to exit transition. Bike – 56 miles 3:11// One loop course, some climbs, mostly rolling. Leaving the reservoir was super tricky because there was a ton of us trying to get going at the same time. It was impossible not to draft for at least the first half of the bike there was just too many people getting out on the course at the same time. After getting out of the crush I settled in and started riding as best I could. I struggle to keep my heart rate up on the bike, I guess I am just distracted and lazy. I was near a group of girls and just tried to stay with them, sometimes leading and sometimes falling back and just trying to keep them in my sights. It helps a lot to say something positive to anyone that passes me or that I pass. I had an eating plan and even created bags of nutrition for each hour on the bike, I thought I was doing well, until I got home and pulled a bunch of leftover food out of my bento box, how I missed it, I don’t know. I felt great until the last 10 miles of the bike, I am guess it was because of the heat and the missed food. Note to be more careful about my calories and keeping cool for the future. T2 4:54// Not sure what all I was doing. T2 was much easier than T1 so I cruised in tried to be quick, put on more sunscreen and cruised out to the run course. Oh man, I was pretty disappointed by the run. I felt terrible when I got off the bike! I just told myself to do everything I could to feel better and keep moving forward even if it was walking. And there was a lot of walking. I started by taking a lot of water, coke, and a salt pill. I kept moving forward and keep trying to make myself feel better. It took most of the first lap but eventually the nausea and dizziness left. At I negative split the run. I was so happy that I was able to stick it out and turn things around, that is what you need in a full Ironman! I still wasn’t moving great in the heat but I was moving and the second lap flew by much faster than the first. I shared kind words to all that I could. I tried to finish strong and then find a place to sit as quickly as possible. Overall I feel okay about this race, it wasn’t my best or my worst….but it was a great way to make some mistakes and learn some lessons before the big show in Whistler! Just over 5 weeks! Big thanks to Cory and my parents for all their support, Team SOAS for keeping me comfortable on race day and Xterra for rushing me a new wetsuit that was amazing! 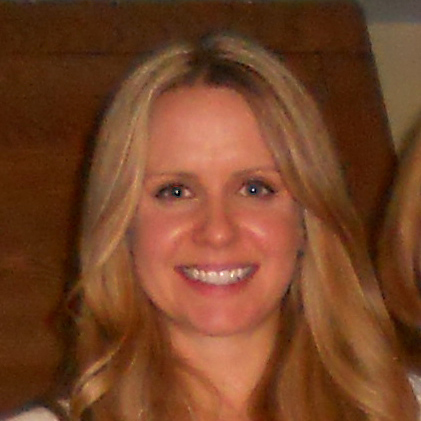 And of course my AMAZING coach Beth Gerdes who puts up with me. Nice work out there. It is always good to shake off the cobwebs and re-familiarize yourself with the sport after a season off. 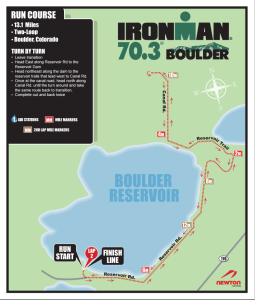 I would love to sign up for IM Boulder 70.3 one of these years. 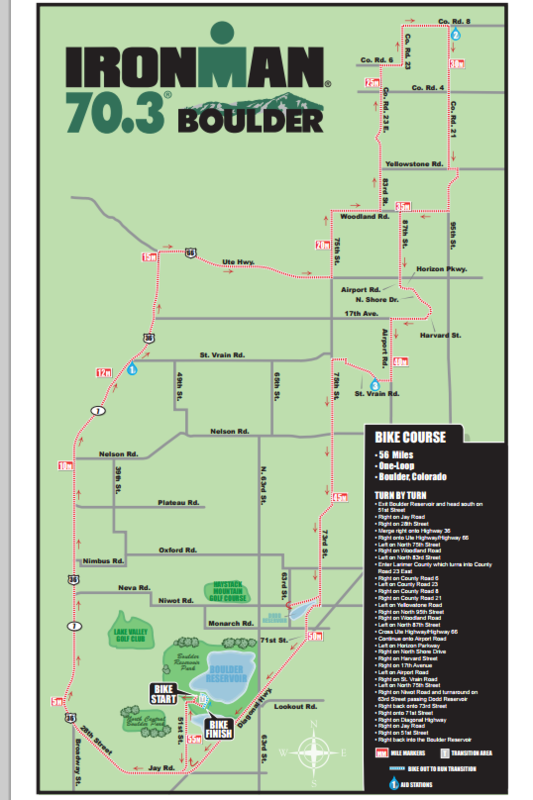 Looks like an awesome course. I can’t believe Whistler is only 5 weeks away!!! Great job sticking with it, especially when you weren’t feeling good on the run – that is TOUGH! Good luck with your final few weeks before Whistler!